Combining “lightweighting” and advanced batteries could bring Tesla Motors and BMW beyond competition for dominance in the sporty luxury electric car space. Tesla CEO Elon Musk told German weekly Der Spiegel that Tesla and BMW have been in meetings on forming a potential alliance in batteries and light-weight carbon fiber components being used in the BMW i3 and i8. Musk finds the carbon fiber made by BMW and its joint venture with materials supplier SGL “interesting” and “relatively cost efficient.” Musk said the talks are exploring whether collaboration might work for battery technology or charging stations. 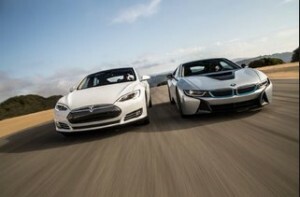 BMW and Tesla had met in June to discuss creating charging stations applicable to different types of electric vehicles. This alliance could expand Tesla’s recent history of working with major OEMs such as Toyota and Daimler. Toyota is moving away from building its RAV4 EV that uses Tesla’s electric drivetrain, but still wants to work with Tesla; the same is true for Daimler, which recently sold its remaining 4% stake in Tesla but wants to continue to collaborate with electric carmaker. Honda will loan $13.8 million to FirstElement Fuel to build 12 more hydrogen fueling stations in California. The hydrogen station supplier received a similar loan of $7.3 million from Toyota earlier this year as part of funding for the first 19 FirstElment stations in California. California wants to have 100 hydrogen stations assembled by 2020. The California Energy Commission granted FirstElement almost $27 million earlier this year; it’s part of a pledge of almost $200 million to bring the 100 fueling stations to the state. Hydrogen stations are expected to expand to other states, including Toyota collaborating on a hydrogen network in the Northeast. Volkswagen, which showed two hydrogen-powered vehicles at the LA Auto Show, is prepared to bring its fuel cell vehicles from Germany to the US market. 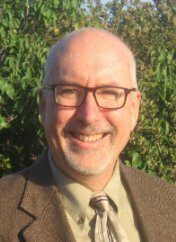 Keith Leech, Fleet Manager at the City of Sacramento and head of Sacramento Clean Cities, has won the 2014 Fleet Excellence (FLEXY) in Public Fleet Sustainability award. “We are the first government fleet in the country that is actually fueling with renewable natural gas (RNG) naturally produced locally from organic food waste using anaerobic digesters that the city did not build. We’re excited to be out in the forefront and support a local start-up company [CleanWorld – a Sacramento Clean Cities partner],”Leech said. Read more about it in NAFA Fleet Management Association’s FLEETSolutions. Clean Cities is rolling out a new program to coordinate bulk alternative fuel and advanced vehicle technology orders. Its new Funding Opportunity Announcement (FOA) is called Alternative Fuel and Advanced Vehicle Procurement Aggregating Initiatives. “By developing a process for companies and organizations to consolidate their orders, it could help vehicle manufacturers achieve better economies of scale and lower prices per unit,” Clean Cities says. The Sierra Club is joining Ford Motor Co. and SunPower’s Drive Green for Life program to help more Americans move toward emissions-free driving. Ford customers who own electric vehicles such as the Focus Electric, C-Max Energy and Fusion Energy plug-in hybrids, will get a $750 rebate on a SunPower residential solar system. Two other models are eligible for the program, the C-Max Hybrid and Fusion Hybrid. The Sierra Club will be receiving a $500 donation for each rooftop solar system through the program. Energy Vision named four winners to its 2014 Leadership Awards in the renewable energy field. Among the winners were Richard DiGia of Aria Energy and Harrison Clay, President, Clean Energy Renewables, whose joint project works with the Seneca Meadows Landfill in Seneca Falls; its first New York State operation converting landfill biogas into vehicle fuel, to ship its renewable natural gas to California, where Clean Energy Renewables distributes it to vehicle fleets. The Coda Sedan now has a second life as the Mullen 700e, an unchanged version of the electric car. The Mullen 700e debuted at the LA Auto Show last week. One big difference is that the 31-kilowatt-hour battery pack is now supposed to deliver the car 185 miles on a charge compared to the previous 125 mile range on the Coda Sedan. The car comes from a post-bankruptcy firm named Coda Cars, whose chief executive Rick Curtis now serves as president of Mullen Consolidated, the corporation that’s overseeing the revival of this electric sedan. The US Department of Defense and the US Air Force are bringing 42 plug-in electric vehicles to the Los Angeles Air Force Base. The non-tactical vehicle fleet gained a $3 million investment from California Energy Commission and comes from an alliance between federal, state, and private energy organizations, Air Force officials said. The fleet is made up of plug-in sedans, vans, and trucks. It’s also serving as a demonstration model for emerging vehicle-to-grid (V2G) technology. The vehicles can direct power to and from the electrical grid when they’re not being driven. The technology is capable of providing more than 700 kilowatts of power to the grid, which could power more than 140 homes in the US. About 280 employers in the US now have workplace electric vehicle charging stations, a number that’s nearly doubled in the past two years. Workplace charging is turning into an effective tactic to attract and retain talented employees while supporting reductions in greenhouse gas emissions and advanced vehicle technologies. Several of these employers are participating in the US Dept. of Energy’s EV Everywhere Workplace Charging Challenge. Starting with 13 founding partners in January 2013, its grown to 150 partners who are providing access to charging stations for more than 600,000 employees at more than 300 worksites around the country. Lux Research presented a cost-of-ownership model comparing gasoline and diesel internal combustion engine vehicles to battery electric vehicles (EVs), plug-in hybrid electric vehicles, hybrids, and hydrogen fuel cell vehicles. EVs lead the way due to the relatively low cost of electricity, and it was followed by various types of hybrids, and plug-in hybrids. Rating measures included fuel cost alone, fuel cost plus operation, and purchase or lease for total ownership cost. BMW’s award-winning electric vehicles and other automakers’ hydrogen-powered cars were the spotlights on Thursday at the LA Auto Show. Like all other car shows, new vehicle introductions and sporty concept cars were prevalent; USA Today’s Chris Woodyard thought the Lexus LF-C2 concept, Audi Prologue concept, and Infiniti Q80 Inspiration concept were memorable. The Infiniti Synaptiq race car took the People’s Choice Award in the 11th annual LA Auto Show Design Challenge. As for more conventional new vehicle rollouts, three of them stood out to observers: the 2015 Mazda CX-3, 2016 Cadillac ATS-V, and 2015 Honda CR-V.
BMW’s new electric cars won accolades, with the BMW i3 taking the Green Car of the Year Award and, on Wednesday evening, the BMW i8 winning Autoblog’s 2014 Technology of the Year Award. The i8 had also won the Motor Press Guild’s 2014 Innovation Vehicle of the Year on Wednesday (along with the 2015 Ford F150). The lightweight carbon fiber and performance of the battery electric and plug-in hybrid systems impressed award judges. For Green Car of the Year, the i3 beat the Audi A3 TDI, the Chevrolet Impala bi-fuel CNG version, Honda Fit, and Volkswagen Golf. Similar to last year, hydrogen fuel cell vehicles were highly visible on display and during the Green and Advanced Technology Ride & Drive. As for concept vehicles, the Volkswagen Golf SportWagen HyMotion and the Audi A7 Sportback h-tron Quattro were popular during the ride and drive; and the Hyundai Tucson Fuel Cell and recently named Toyota Mirai were the production models to view during the show. Honda had unveiled a revised version of its FCV Concept in Japan a few days before the LA Auto Show; that car will be rolling out in 2016. For those of you interested in seeing a plug-in hybrid combined with an alternative fuel, the Audi h-tron can travel about 310 miles on hydrogen and about 31 miles on the battery. The Ford Fusion Energi and Toyota Highlander Hybrid won the first-ever Green Fleet Car and Truck of the Year awards during a luncheon meeting. Readers of the Bobit Business Media publications including Green Fleet voted on the winners. 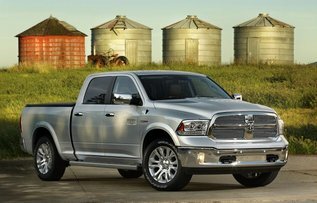 The Nissan Leaf and Honda Civic Natural Gas were runners up in the car category, while the Ram 1500 Eco Diesel and Ford Transit T150 Wagon FFV finished in the top three for the truck category. Bobit Business Media had collaborated with, and received technical assistance from, the National Renewable Energy Laboratory, Oak Ridge National Laboratory, and Argonne National Laboratory to determine the award nomination and selection criteria. Henrik Fisker has left the extended range Fisker Karma sports car behind and has gone back to another passion – designing muscle cars. Fisker and partner Galpin Auto Sports unveiled the Fisker Rocket, a 725-horsepower reworking of the 2015 Ford Mustang that Fisker called the “ultimate American muscle car.” It has several exterior modifications to give it a distinct look that Fisker has a lot of experience creating. I think the most visible car on display this year was the Nissan Blade Glider, a zero emission vehicle concept car. (See photo above.) Another good one was Volvo announcing its 2016 XC90 seven-passenger SUV during the show. Honda unveiled the Honda Developer Studio, an online portal and open innovation workspace in Silicon Valley. It’s part of Honda’s connected car strategy and coincides with its new Connect system for infotainment and navigation. It’s Android-based but it’s not part of Google’s Android Auto, Honda said. Through Hertz 24/7, the major car rental company’s carsharing division, Hertz was demonstrating its PIN-pad six-digit code system at the ride and drive. The idea behind it is that you can leave the car or truck in a parking lot and the next Hertz 24/7 user can open and start it from the door panel or from their mobile device. Drivers can use the NeverLost dashboard device to get directions anywhere they want to go. They’re testing out the system on pickup trucks with Lowes so that users without trucks can go by some large items that won’t fit into their cars and will have access to a pickup for a couple of hours. Team Fuel Saver won the Ford Car-Connected City App competition. That came out a September hackathon competition with 70 entrants that were narrowed down to 10 finalists from the developer community. The Team Fuel Saver shows all kinds of data on fuel consumption, fuel prices, and oil changes and other maintenance activities. The 10 finalists showed their apps during Connected Car Expo and the winner will be demonstrated at the CEI convention in January. David Cummins, senior VP and managing director at Xerox Services, talked about the urbanization trend in US cities and how it’s affecting the future of cars. Baby Boomers – about 50-to-70 years old, are showing more interest and appeal with driverless cars; as the generation ages and loses the ability to drive, the advanced technology is expected to gain support. Millennials in the 18-to-35 year old age range are showing a lot of interest in what he called “urban mobility networks” and their implications for getting through traffic congestion and reducing air pollution as more of them live and work in metro areas. The challenge for connected, autonomous vehicles will be building a platform between public and private providers. The cornerstone must be “open data,” and a flexible network that can meet new innovations, Cummins said. 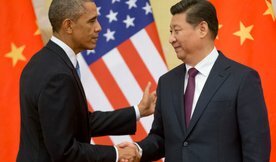 The United States and China, which together produce 45% of the world’s carbon emissions, made an agreement last week to extend their greenhouse gas emission reduction targets farther than before. The US has set a goal of cutting its own greenhouse gas/carbon emissions more deeply by 2025 than its previous goal through 2020. To meet the new target goal of reducing emissions 17% by 2020, the pace will have to double, according to the White House. China, which has been producing a very high carbon output through coal-powered energy plants, has agreed to cap its carbon emissions by 2030 or earlier; that will come through 20% of its electricity being generated through wind, solar, nuclear, or other zero-emission sources. While stopping climate change may not be backed by everyone, air pollution is a large factor, especially in China. Transportation has expanded dramatically in Beijing and other cities, prompting municipalities and the national government to support more electrified and alternative fuel vehicle options. Per usual, fleets have been making some decisions on alternative fuels and vehicles in their fleet acquisitions with four interesting announcements made in the past week. 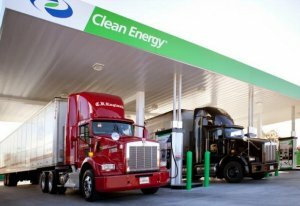 Ryder System is working with Mansfield Energy and Clean Energy Fuels to offer compressed natural gas (CNG) vehicle and fuel solutions to bulk fuel haulers……. Frito-Lay and its parent company PepsiCo have agreed to an aggressive plan to conserve fuel and reduce emissions for its delivery trucks and sales cars; through a partnership with Clean Fuels Ohio, a non-profit alliance supporting clean air in the state, Frito-Lay has already brought in 45 propane-powered Ford E350 vans and five electric Newton delivery trucks…… Nestle Waters North America added five medium-duty beverage trucks fueled by propane autogas at its Los Angeles location; Roush CleanTech supplied the trucks that will deliver Arrhowhead Mountain Spring Water in the region…….. In its 12th annual Sustainability Report, UPS reported that it met its 2016 goal of reducing its air and ground transportation fleet’s carbon intensity by 10% three years early. Last year, carbon emissions decreased 1.5% from 2012 even as global shipping volume increased nearly 4%. “Industrial technology advances by the OEMs” were one of the key reasons these gains were made, according to Mike Britt, director of maintenance & engineering, international operations, ground fleet for UPS. The US Senate is expected to vote on the Keystone XL pipeline today, which passed through the House on Friday. The bill, which would allow for a pipeline between Alberta and Houston, would transport refined tar sands oil back to refineries in Canada. If the bill passes through the Senate, the president may veto it or stall on it while waiting for the US State Department to release its statement on the project. It’s been nearly six years that the Canadian government and oil industry has been pushing to get this through. Land Rover may take on Tesla with an electric Range Rover model, which will probably be a smaller version of the luxury SUV than the flagship model. The upcoming Jaguar compact model based on the C-X17 concept could be the basis for what Land Rover rolls out. NGVAmerica has released its NGVAmerica Station Analysis Map that shows US compressed natural gas and liquefied natural gas station locations, accessibility, and contact information. It also highlights the vehicle ranges supported by the stations in 100-, 400-, and 600-mile increments. Its purpose is to help fleet operators make their routing and travel planning easier with natural gas fueling. Via Motors received EPA certification for its plug-in hybrid van. The eREV is now available to fleet customers in the US; Via has delivered about 25 of them so far. Via says it can get more than 100 mpge in typical daily driving. 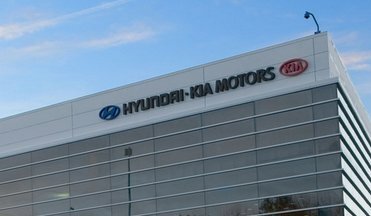 Hyundai and Kia plan on raising their fleets’ average fuel economy 25% by 2020 to meet emissions regulations in the US, Europe, and South Korea. To do this the number of green cars available for sell will increase from seven to 22, the company says. That will come out to 12 hybrid models, six plug-in hybrid mid-size and compact cars, two battery-electric cars, and two fuel-cell cars. Natural gas is feeling more scrutiny in California, where its measurement and taxation rates are being redefined by the State Board of Equalization for the first time since 1971. The agency is using existing Use Fuel Tax Laws; CNG will now be sold as a gasoline gallon equivalent equal to 8.87 cents per gallon, or 5.66 pounds; it has been six cents per 100 cubic feet. LNG is currently seven cents per gallon and will go up to a diesel gallon equivalent (DGE) equal to $.1017/DGE or 6.06 pounds. Dispensers also have to show “gasoline gallon equivalent” on CNG and “diesel gallon equivalent” on LNG. The 2015 Alternative Clean Transportation (ACT) Expo will highlight another industry alliance, this time through an expanded partnership with Trucking Efficiency; this is a joint effort between the American Council for Freight Efficiency and Carbon War Room. Their goal is to double the freight efficiency of goods movement in North America. 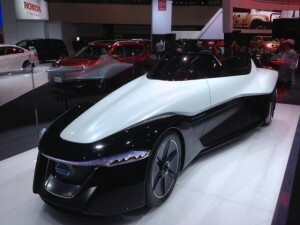 Honda revealed a revised version of its new hydrogen fuel-cell vehicle in Japan. The Honda FCV Concept will soon be shown with more details as to what the five-passenger mid-size sedan will look like when it appears on Japanese roads in early 2016. At the LA Auto Show next week, Honda plans to announce its commitment to assist in expanding California’s hydrogen fueling stations. Neighborhood Electric Vehicles: GreenTech Automotive is counting on low-speed electric vehicles finding the right audience as it ramps up at its Mississippi plant to build its MyCar neighborhood electric vehicle (NEV). Pike Research had forecasted that NEVs on roads throughout the world would increase from 479,000 in 2011 to 695,000 by 2017. Communities around the US are trying out NEVs on restricted roads to see how that affects air pollution and traffic congestion. Self-Driving Cars: Google has said that one of the reasons the technology giant is investing in self-driving car test projects is that people with disabilities will have greater transportation options. It will also take human error out of driving and improve road safety. Unmanned aerial vehicles (UAVs), or drones, have been closely tracked by proponents of self-driving cars as a technology that will cross over into ground transportation. Lux Research sees potential for market growth in UAVs as they move from military surveillance drones to broader commercial vehicles if government regulations allow for it. Government agencies are ruminating over safety and privacy concerns. Fuel Cell Vehicles: Fuel cell vehicles powered by hydrogen have been ending up as forklifts in warehouses, distribution centers, and manufacturing facilities as companies such as BMW, Coca-Cola, Fed-Ex, and Wal-Mart recognize the quick refueling times and enhanced performance that fuel cell forklifts deliver. Propane Autogas: Police departments are trying out propane autogas as a way to use a clean, domestically produced fuel with lower cost per mile than gasoline. Other propane vehicle applications in recent years include: buses, light- and medium-duty trucks, shuttle buses, taxis, landscape equipment, and agricultural equipment. Drayage and Other Port Vehicles: Vehicles used in drayage, trucking, and other functions at the Ports of Los Angeles and Long Beach are being powered by liquefied natural gas (LNG), electricity, hydrogen, and clean diesel. Clean vehicle programs have been adopted by these and other ports in the US to improve air quality and support alternative, domestic fuels. NGV Trash Trucks: Waste Management, Inc., has embraced natural gas to power its refuse/trash truck fleet. Some of that has been produced from its landfill gas projects. Municipalities are considering using natural gas vehicles, hybrids, and other alternative fuels and technologies in their fleets. They’ve been watching their transit agencies go this route in recent years and are seeing payoff within two-to-three years from fuel cost savings and meeting government mandates on reducing emissions. Big Oil investments in alternative fuels and energies – how serious are they? 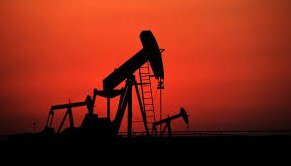 In recent years, major oil companies (also known as Big Oil) have been investing in alternative fuels and energies to meet government and corporate mandates and through their own speculation about the future of oil supply and changing public attitudes. There’s been a mixed bag of perspectives shared by leaders in sustainability and cleantech on the role that Big Oil will play in the future; some would rather see these companies completely go away soon while other analysts suggest supporting oil industry investments in alternative energies and carbon mitigation. Here’s the latest from Lux Research and other analysts………. Lux Research has seen enough movement in the alternative fuels industry to release a report analyzing how oil companies have been financing its commercialization. The analyst firm explored its database of over 1,000 deals and partnership engagements between 2000 and September, 2014. Methods analyzed included private placement, equity stake, JVs, mergers and acquisitions, other than general partnerships. The seven most active oil major companies in its database are Shell, BP, Total, Valero, Chevron, Petrobras, and Reliance. Long before its Gulf of Mexico oil spill, BP has been active in alternative energy invesments; Lux Research says the oil giant leads its industry in investment frequency in a variety of alternative fuels and energies. BP has had a strong focus on the crop development by transgenics and breeding, with repeated investments made to Chromatin and Mendel Biotechnology. It also continues investing in biomass to sugar technology including cellulosic biomass. Shell forecasts that energy demand will double in the world by 2050 and is now working with partners to ensure that it can survive through the next century; carbon emission mitigation is another force for change Shell is monitoring. Meeting that demand will require being open to new energy resources. Shell CEO Ben van Beurden talked about the urgency of mitigating carbon emissions and its impact on climate change in a recent speech at Columbia University. He also talked about supporting renewables and energy efficiency. Shell has formed partnerships and joint ventures (JVs) with Codexis , Cosan, and Novozymes to support growth in cellulosic ethanol. Shell has invested in Raizen, its ethanol JV with Cosan to create what it calls the largest sugar and ethanol company in the world. It also partnered with Virent on the biomass catalytic conversion to produce renewable gasoline, and Cellana on algae biofuel. However, don’t forget to keep it all in perspective. “If Shell is serious about investing in a clean energy future they must stop actively undermining our climate and clean energy laws,” said Merrian Borgeson, senior scientist at the Natural Resources Defense Council (NRDC). The Union of Concerned Scientists (UCS) also launched a campaign pressuring Shell to join tech firms in dropping support for the American Legislative Exchange Council, a group that has modeled legislation to oppose climate action and repeal incentives for renewable energy. Shell came under fire from environmentalists in 2009 for selling off its wind and solar projects to focus on biofuels and carbon capture and storage. Oil companies do work hard at keeping their investment portfolios profitable – that might mean leaving an energy sector behind. In September, Chevron Corp. finalized the sale of its renewable energy subsidiary OpTerra Energy Services. The oil giant also sold the energy efficiency and renewable energy arm of Chevron Energy Solutions, a division of Chevron USA, and pulled back funding for biofuel projects. ExxonMobil Corp. has also dropped funding for biofuels projects; natural gas has paid off better for the oil giant. BP divested its wind farm division in the United States last year to focus on its high-yield oil and gas projects. O’Hare International Airport in Chicago will be opening an alternative fuel station in early 2016 offering compressed natural gas, biodiesel, and fast-charging stations. Taxis, shuttle buses, and electric vehicle owners will have access to charging, alternative fuels, and conventional gasoline. The aviation department says that an increasing number of vehicles using the airport are powered by alternative fuels including taxis and hotel and rental car shuttles. The center will be also be open to the general public. Clean Energy Fuels will work with PMG Airport Developers, which has built and operated other airport travel plazas. The Propane Education & Research Council launched a new series of educational videos called Clean American Innovation featuring interviews with leading US equipment manufacturers discussing their efforts to develop and commercialize new propane autogas technologies. PERC visited manufacturing facilities across the US to show cutting-edge propane technologies in production. Freightliner Custom Chassis, Kohler Engines, Power Solutions International, Roush CleanTech, and other companies participated in the videos. Diversity is the word for Ward’s 10 best engines 2015 nominees. Of the pool of 38 nominees, five are diesel, two hybrids, five electric vehicles, one plug-in hybrid, one is a CNG flex-fuel V6, and one is a hydrogen fuel-cell vehicle. Twenty one of the engines are turbocharged, and four-cylinder turbo engines prevail. For the past decade, WardsAuto says its list has become more diverse than the previous year. Winners will be named in mid-December and awards handed out at North American International Auto Show in January. Slower-than-expected demand for electric vehicles has caused Continental AG to likely end a battery cell joint venture with South Korean company SK Innovation Co. While there’s been general interest in battery-powered vehicles, people are delaying their purchases, says Continental CFO Wolfgang Schaefer. The National Auto Dealers Association’s Get the Facts campaign continues with a new ad that highlights what it calls the “benefits of price competition.” It’s a brightly-colored cartoon that emphasizes why negotiating is good for buyers. This has come out in the wake of a series of videos published by Edmunds that ridiculed this practice, which it calls “haggling.” Get the Facts also explores the value of franchised dealers as they battle Tesla Motors over state laws on franchised dealers and car sales. The new 2015 Honda Civic Natural Gas will be rolled out in 37 states on Nov. 19 with a base price of $26,740 not including the $790 destination fee. It comes with a five-speed automatic transmission, a seven-inch touchscreen audio display, rearview camera, and LaneWatch display as standard features. As for mileage, its gasoline gallon equivalent is 27 mpg city, 38 highway, and 31 combined. BMW will be running a pilot project in Munich next year where street lights will charge electric cars. BMW will be testing out two prototype “Light and Charge” street lights that combine LED with BMW’s ChargeNow charging stations. These will be the first street lights that can charge electric cars and come straight from the existing local authority street lighting infrastructure, BMW said. Drivers will be apple to pay for their charging via a mobile phone app. Fisker Automotive will continue working with Quantum Fuel Systems, licensing plug-in hybrid control software for use in the Karma. Fisker will be paying Quantum $2 million before the end of the month to close the deal to renew their relationship and continue with the same control software used previously. Fisker will also pay an additional $2 million by late October of next year to license software for its next vehicle, the Fisker Atlantic. As the NGVAmerica North American NGV Conference and Expo starts up today in Kansas City, Mo., one issue is inevitably going to be mentioned by speakers and at luncheon tables. The California Air Resources Board (CARB) just-released proposed changes to adopting the state’s Low Carbon Fuel Standard would give natural gas vehicles lower clean fuel ratings as a means to reduce greenhouse gas emissions. That would likely mean less funds will be available for grants, incentives, and through participation in California’s cap-and-trade credit market. NGVAmerica is challenging CARB to refrain from adopting its proposed GREET 2.0 model that puts natural gas lower on the scale due to emissions of unburned methane escaping from a natural gas vehicle’s tailpipe. “We respectfully urge CARB to refrain from making changes in the California GREET model at this time,” NGVAmerica’s Jeffrey Clarke, director of regulatory affairs and general counsel, wrote in a letter to CARB. Similar letters have been filed by Clean Energy Fuels Corp, Westport Innovations, the California NGV Coalition, Southern California Gas Co., and others. They’re making the point that the methodology CARB used in its proposed policy drew from obsolete data; and it was released in October with only nine days to respond. The Low Carbon Fuel Standard and the cap-and-trade market came from the passage of AB 32 in California with targets to reduce greenhouse gases to 1990 levels by 2020. Credits being traded by oil companies, refineries, utilities, and other carbon producers through cap-and-trade have brought more funds to the state with a sizable chunk of it now being available for clean transportation projects. There will be an important meeting by CARB coming up in February on adopting changes to the Low Carbon Fuel Standard that will affect the future of natural gas vehicles in the state. 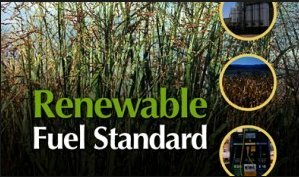 Renewable natural gas (such as Clean Energy Fuel Corp.’s Redeem fuel) has made financial gains through California’s carbon credits. Whether biomethane will be included in CARB’s natural gas vehicle cutback is yet to be seen. Another significant development coming up in 2015 is transportation fuels being added to the cap-and-trade system. Starting in January, oil companies and refineries will begin adding fuel that ends up in gas stations to the credit allowances that they buy that make up for the excessive greenhouse gases that they’re releasing at their refineries. In 2015, they’ll have to buy extra allowance credits to pay for the emissions coming from gasoline, diesel, and jet fuel sold in the state. One major oil company is sending a loud warning to the legislature and residents of California: this will cause a big spike in gasoline prices.Chevron Corp., based in San Ramon, Calif., has been warning that gasoline prices will spike up because of AB 32 implementation adding fuels to its cap-and-trade list next year. State officials and economists don’t see this happening, but it has been an effective argument for Chevron and its oil industry colleagues to make. Gasoline prices aren’t expected to go up next year, but their analysts warn that adding transportation fuel to the carbon credit market could jack up credit prices, which will make its way back to gasoline and diesel going up as much as 50 cents a gallon at gas pumps. CARB chairman Mary Nichols says that it will take a few years for transportation fuel to see the effect of cap-and-trade. Compliance starts on January 1, but it’s phased in over time. Transportation fuel was added to the cap-and-trade process later than other energy sources to make adoption of the rules more viable, she said. Transportation fuel is the single largest source of carbon pollution in the state and bringing it in after credits being used by electric utility companies and other industries has expanded the number of allowances in the system and makes the whole program much more liquid, she said. A new job certification category was just released that should be very good news to educators in programs supporting skilled workers servicing alternative fuel vehicles. The National Institute for Automotive Service Excellence (ASE) last week announced the Light Duty Hybrid/Electric Vehicle Specialist (L3) certification category. Service technicians may register starting Dec. 1, 2014, and testing begins in January 2015. The L3 Certification Test Reference is included as an electronic pop-up during the test. This document identifies the concepts for the hybrid/electric vehicle technology included in the test, and outlines the three common types of hybrid/electric vehicle drive systems, with diagrams shown for each type. As discussed by educators last February at a day-long workshop, there is a real need for certified service technicians working with hybrids and electric vehicles. Dealers, fleets, and maintenance garages will need to hire more service technicians trained to keep these vehicles running safely and efficiently. As I’ve mentioned many times in this newsletter, and since starting my consulting practice, education and public awareness programs are essential for job creation, vehicle acquisition decisions, and support in legislatures and corporate boards. The best training programs out there are coming from community colleges across the country; along with service technicians, training is being delivered for maintenance and repair, fueling stations and infrastructure, other technology courses supporting natural gas, propane autogas, hybrids and electric vehicles, hydrogen, and biofuels. US Dept. of Energy’s Clean Cities Coalition Coordinators are very good to contact for guidance on these resources. NAFTC is a nationwide training organization, headquartered at West Virginia University, that develops curricula and conducts more than 20 courses and workshops focusing on alternative fuel and advanced technology vehicles. NAFTC works with US Dept. of Energy (DOE) and Clean Cities, and has 30 national training centers located throughout the US. NGVI offers natural gas vehicle education, in-house training, and public education forums, technical assistance, and awareness programs for government, utility companies, suppliers, and customers. Propane Education & Research Council (PERC) offers guidelines for constructing or modifying repair and maintenance garages for propane autogas-fueled vehicles including passenger cars, vans, buses, and trucks. Fleet managers, operators, and private garage owners are given information on basic requirements of a propane autogas-fueled vehicle repair or maintenance garage. NPFA is considered by educators to be an essential resource for training programs serving emergency responders. In September, NFPA received a Federal Emergency Management Agency grant to develop NFPA’s Alternate Fuel Vehicle Safety Training. NFPA’s online program will be used to provide free training to the US fire service on safe handling of electric, hybrid, hydrogen fuel cell, compressed natural gas, liquefied natural gas, and liquefied petroleum gas at incidents involving passenger vehicles, trucks, and buses. Powered by technology developed by Automotive Research and Design, The Hybrid Shop is an international network of service centers dedicated to bringing scientifically-sound, environmentally friendly, and cost effective repair solutions to owners of hybrid and electric vehicles. CVEF manages a DOE-funded program that increases awareness of compressed natural gas (CNG) cylinder inspection requirements; and encourages natural gas vehicle owners to periodically have their tanks inspected. Check out DOE’s AFDC section on natural gas vehicle maintenance and safety. It’s an educational site covering cylinder inspection, oil-change intervals, ignition systems, and other topics. 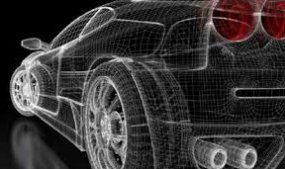 The Society of Automotive Engineers has working groups that issue standards shaping the way alternative fuel vehicles and the charging/fueling infrastructure are designed and manufactured. Two good sites to research are focused on alternative fuels and vehicle electrification. 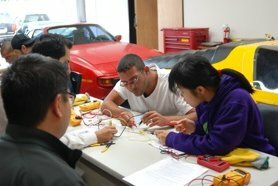 ACDC offers hybrid and electric vehicle technician training through classrooms and other channels such as webinars and DVDs. Its hybrid training goes back to 2000, and electric vehicles were added in 2008. Hyundai and Kia will pay a $100 million fine for inflating the fuel economy ratings of their vehicles. The $100 million fine is the largest in Clean Air Act history, and came from an investigation by the US Environmental Protection Agency and the Department of Justice based on the sale of about 1.2 million vehicles with overstated ratings. Reductions in greenhouse gas emissions were far less than what was originally stated – about 4.75 million metric tons of greenhouse gases in excess of what the automakers claimed to the EPA. “This settlement upholds the integrity of the nation’s fuel economy and greenhouse gas programs and supports all Americans who want to save fuel costs and reduce their environmental impact,” said EPA Administrator Gina McCarthy. Plug-in sales: October saw deliveries of 2,589 Leafs, bringing the year-to-date total to 24,411 – which exceeds the 2013 total of 22,610, the previous record. The Nissan Leaf broke its own record for most electric cars sold in the U.S. in a single year with two months left to sell them this year. The Chevrolet Volt has also been seeing a strong year, already exceeding the annual sales totals for the Volt in any of the full three years it’s been on sale. BMW sold 1,159 BMW i3s – the third month in a row it has sold more than 1,000 i3s. Tesla continued to go unreported in its monthly sales numbers, but the company says that sales went up quite a bit during the month. Very redesigned Chevy Volt: The refreshed 2016 Chevrolet Volt will be quicker, lighter and more fuel efficient than its predecessor. GM is using the redesign as an opportunity not only to optimize the plug-in hybrid technology it pioneered four years ago. It’s going to be very different with a completely difference drive unit and battery. The car will travel father on battery power, yet GM hasn’t yet said how far it will go compared to its present 38 miles on the battery. Vincentric, a leader in cost-of-ownership data, released its most recent Hybrid Analysis last week. Among the 10 hybrids with lower ownership costs were the Lexus CT200h and the Toyota Avalon Hybrid, which when compared to their all-gasoline counterparts had savings of over $7,600 and $3,200 respectively. Ten of 31 hybrid vehicles analyzed were identified as having a lower total cost-of-ownership than their closest all-gasoline counterpart. Over the past three years the percentage of cost-effective hybrids has dropped from 44% in the 2012 analysis, to 39% in 2013, to now just over 32%. Natural Gas Vehicle Conference. The 2014 North American NGV Conference & Expo to be held at the Kansas City Convention Center Nov. 11–14 in Kansas City, Mo. is set to be the largest NGV event of the year and is hosted by NGVAmerica in cooperation with the Canadian NGV Alliance. NGVAmerica has reached out to fleets of all types and sizes with special discounts to register for the conference. For more information on the 2014 North American NGV Conference & Expo, or to plan your attendance, visit the event website at www.ngvamerica.org/conference/2014. Check out this TedxDetroit video: Debbie Mielewski, the technical leader for plastics research at Ford Motor Co., says she’s been able to get up every day excited to go to work. Much of what is being added to cars these days is plastic, which comes from petroleum resources, and she’d like to do something about it. All of the polyurethane going into Ford vehicles and their seat cushions now comes from soy beans (which Henry Ford would have been proud of, having started that years ago). Using wheat straw (which is the byproduct of the food portion of wheat) to fortify plastic bins in the Ford Flex and Ford Focus, has been another step forward. And there’s more……. Big numbers from VW: Volkswagen Group claims it will launch more than 20 electric vehicles and plug-in hybrids in China over the next few years. That will include small cars, large-sized SUVs, plug-in hybrids, and battery electric cars, said Jochem Heizmann, head of Volkswagen Group China. Home energy storage. Nissan is moving the “electric vehicle batteries as a great source for energy storage” campaign along. Nissan will soon begin testing its Leaf-To-Home energy station in Japan; they’ll be testing the ability of electric cars to provide temporary electrical power to buildings in real-world circumstances. The station converts high-voltage direct current from a Leaf’s lithium-ion battery pack into the 100-volt current used by homes in Japan. Mercedes-Benz B-class electric cars. Daimler AG’s Mercedes teamed up with Tesla Motors to put an electric motor and battery inside its B-class hatchback. Mercedes-Benz has high hopes for the alliance and sales of the B-class electric cars. The German automaker is hoping the image of working Tesla will be impressive while avoiding the pitfalls of spending billions on a technology few may want to buy. Hyundai vs. Toyota. Hyundai will roll out its first “dedicated” hybrid, designed to be marketed exclusively as a hybrid instead of being merely a copycat of an existing traditional engine edition of that model. Hyundai Motor Co. said that its hybrids will go up again the Toyota Prius.